What you eat matters and where you eat matters just as much! Jersey has an abundance of amazing restaurants with quite a few of them in exceptional seaside locations. To go straight from a stroll on the beach, shake the sand of one’s shoes and order a glass of wine while studying the menu is quite a unique yet simple pleasure. Green Island is a beach, an island and a restaurant. The island is a tiny rocky mount also known locally as La Motte; the beach doubles in size as the tides goes out and the restaurant, with its terrace to enjoy lunch or dinner, has a menu with Mediterranean influences to please most palates. The views are impressive as the restaurant room faces directly south. There is nothing there between you and France, only the sea which provides the restaurant with the freshest possible seafood. Why not try the local delicacy – Grouville Bay oysters – and reward yourself with a satisfyingly well chilled glass of their Muscadet. Green Island is a fabulous place to enjoy a fine dining experience with just the right amount of sophistication. 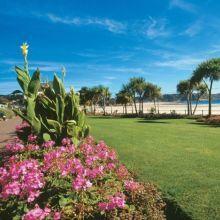 St Brelade’s Bay has all the features required for exceptional relaxation. This is the place to come and watch the world go by while indulging in anything you fancy at the time – from a Jersey Dairy Luxury Ice-cream to a freshly composed lobster salad. On the east side of the bay, The Beach House offers spectacular views of the whole beach from its lovely terrace, an ideal place to graze on a plate of tapas. Further along the promenade the choice is almost endless! To take advantage of it all, you could stay in the L’Horizon Hotel & Spa, with a Grill and a Brasserie that will no doubt have suitable menus for all tastes. Next to the hotel is the very pleasant Wayside Cafe where excellent value lunch, dinner, salads and sandwiches are available. A little further along still the Oyster Box and the Crab Shack – which share the same owners – manage to cover all eventualities when it comes to food. Lunch, diner, familial (Crab Shack) or elegant and romantic (Oyster Box), both venues are easy places to spend a lot of time while admiring the views. We quite like the Oyster box webcam…have a look! With 5 miles of beach, surf and walks, St Ouen’s bay’s wild beauty lends itself more to casual cafes than actual restaurants. The quality of the food served all along the bay deserves more than a quick look though. Now established as a local favourite, El Tico Cantina has it all: the views, the affordable menu and the friendly service. A fantastic spot for breakfast, lunch or dinner. A few other institutions are dotted all along St Ouen’s beach…all are welcoming whatever the weather and will instantly transport you to that holiday mood we all love to feel. Big Verns, the Watersplash and the recently refurbished Le Braye Cafe are waiting for you. Mark Jordan at the Beach combines all the previous ingredients, gorgeous beach views and fresh products are always a winning combination. This is Jersey at its best! This entry was posted in Jersey Restaurants and tagged Jersey Beaches, St. Brelade's Bay, St. Ouen's Bay. Bookmark the permalink.